Choose the right pork belly. If you go to the time and trouble of curing and smoking your own bacon, start by procuring a pork belly worthy of your efforts. This means from organic hogs (or hogs raised humanely without hormones or antibiotics). Or from a heritage breed like Berkshire, Duroc, or Kurobuta. Each has a richer, meatier, more distinctive flavor than industrial pork bellies. By the way, a full pork belly weighs 10 to 12 pounds. Whole Foods will sell you pork bellies by the pound, which may be easier to handle for home smokers. Remove the skin. 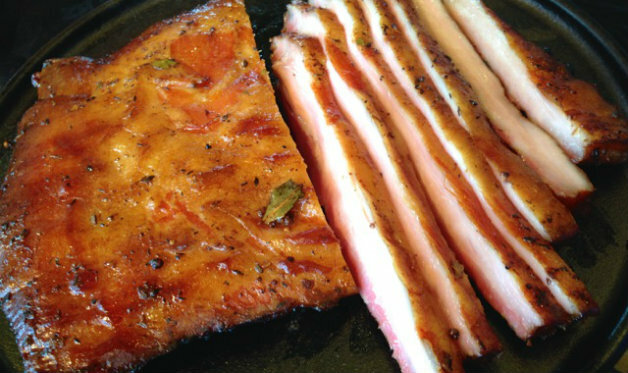 The bottom of a pork belly usually comes with skin (rind), which will be tougher than the rest of the bacon. (It also blocks the absorption of the cure and smoke flavors.) Commercial smokehouses remove it using a slicing machine. At home, you’ll have to work a bit harder. Start at one corner and use a sharp, slender knife to separate the skin from the meat, angling the knife blade toward the skin. Better yet, ask your butcher to skin it for you. Note: Do not discard the pork skin. Direct grill it over a medium flame on both sides (start belly side down) until crisp and golden brown to make “brownies”—crackling crisp bits of skin to fold into pulled pork. Or deep fry it in oil to make chicharrones (pork cracklings). It can also be used to give flavor to beans or greens. Prepare the cure. The basic ingredients are salt and sugar and optional curing salt (sodium nitrite) and pepper. You can achieve a wide, subtle range of flavors by varying the source and proportions of these ingredients: white sugar or brown sugar, maple sugar, or even freeze-dried cane sugar juice. Ground or cracked black pepper or hot pepper flakes. Bacon makers in Scandinavia add juniper berries and other aromatic spices. I like to mix the cure ingredients by hand—especially when using brown sugar, so you can break up any lumps with your fingers. Note: you can also cure bacon in a brine, which we’ll discuss in a future blog post. Cure the pork belly. Arrange the belly on a rimmed baking sheet. Season and rub it on both sides with the cure as described in the recipe. Place the belly in a large, sturdy, resealable plastic bag in a foil pan or roasting pan on the bottom shelf of your refrigerator. (The pan will catch any potential leaks.) Cure the bacon for 5 days, turning it over each day. This is very important. As the cure dehydrates the bacon, liquid will gather in the bag. It’s supposed to. Think of it as brine. Rinse and dry the belly. Transfer it to a colander and rinse both sides well with cold water. This removes excess salt. Next, blot the belly dry and place it, uncovered, on a wire rack on a baking sheet on the bottom shelf of your refrigerator. Let dry for at least 4 hours or as long as overnight, turning once or twice. This helps form a pellicle—an exterior skin that feels papery and dry and just a touch tacky—for the smoke to adhere to. Without the pellicle, you won’t get the bronzed surface that makes bacon look so darn irresistible. Smoke the bacon. Set up your smoker according to the manufacturer’s instructions and preheat it to 175 degrees. If you’re using a charcoal smoker, the temperature will fluctuate between 160 and 180 degrees. If using an electric or gas smoker, you can set it right at 175 degrees. For smoking fuel, use hickory, apple, or cherry, or other preferred hardwood (or blend of woods). Personally, I find mesquite too strong. Depending on your smoker, you’ll use chunks, chips, sawdust or pellets. The smoking time will range between 2 to 3 hours—you’re looking for an internal temperature of 150 degrees. Chill and rest the bacon. Let the bacon cool to room temperature on a wire rack over a baking sheet, tightly wrap in plastic wrap, then refrigerate for at least 4 hours, preferably overnight. (This sets the flavor and texture.) Refrigerated, the bacon will keep for at least 5 days; frozen, it will keep for several months. Slicing and cooking. One of the benefits of making your own bacon is that you can slice it as thick as you like. If you’re used to soft, thin-sliced supermarket bacon, wait until you sink your teeth into a 1/4- to 1/2-inch-thick slice. Sure, you can crisp it in a cast iron skillet (start with a cold skillet to minimize shrinkage). But I like to cook my bacon on the grill (direct grilling over medium-high flame). Just leave plenty of open grate space so you can move the bacon if you need to dodge flare-ups. You can also bake or indirect grill the bacon on a wire rack over a foil-lined rimmed baking sheet—a great way to prepare it for a crowd. A temperature of 350 to 375 degrees works best. The bacon will take 20 to 25 minutes to cook. See the recipe for specific measurements.